Give your father the best gift ever by letting this birthday card express to him that you feel lucky to have such a loving father. This will warm his heart and add joy to his day. This perfect birthday card showcases decorative lit candles, star confetti, great colors, and of course, the meaningful birthday message! Surprise your dad by sending him this memorable birthday card today! If your father has always been there for you, as a child and adult, then this birthday card will make his day. It thoughtfully mentions that words can't express how much it means to you, and that he is an exceptional father. 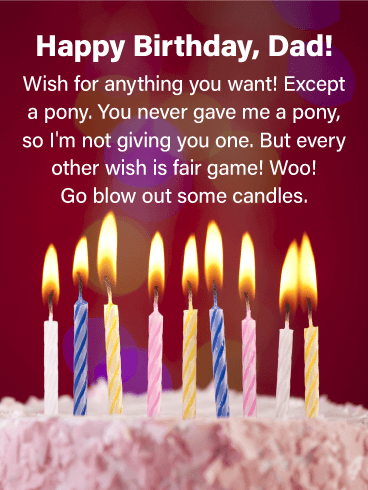 This birthday card also contains colorful lit candles and a sparkling purple background that give this greeting card an element of birthday cheer! 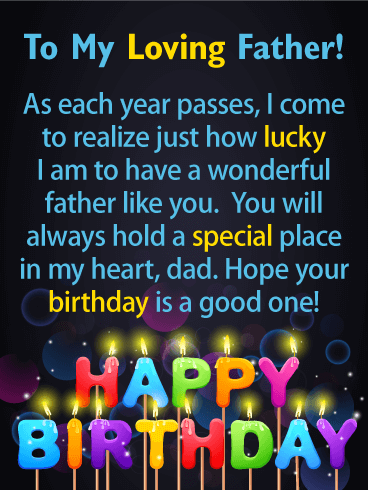 Wish your father a great celebration today by sending this festive birthday card on its way! Wish your father a birthday he will never forget with this creative birthday card! 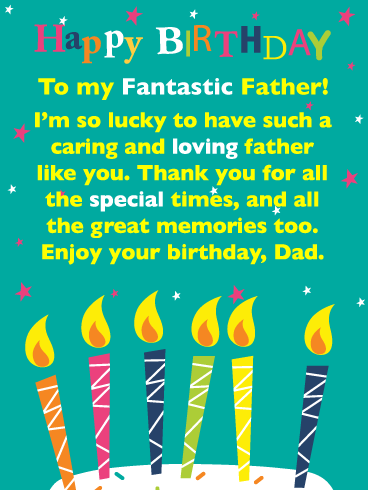 It features a fabulous set of colored candles, and will give you a chance to let your dad know he is awesome, as well as thank him for all that he has done for you. This birthday card will make him feel appreciated on his big day. Send these candles on their way to wish your father a happy birthday and a fantastic year! He will love it! If you are looking for a great birthday card for your father, you are in luck! This cheerfully designed birthday card displays brightly lit birthday candles with eye-catching patterns, and well as a festive shimmering blue background! 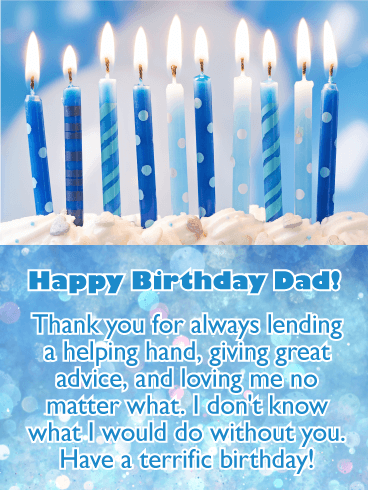 Best of all, this birthday card thanks your dad for always lending a hand, giving advice and loving you, his child, no matter what! So add some joy to your father's day and wish him a terrific birthday today! 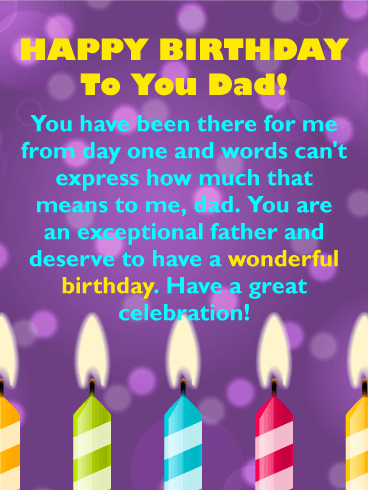 Send your father the priceless birthday gift of feeling special and loved with this caring birthday card! It expresses that you feel lucky to have him as your father and that he will always hold a special place in your heart. This birthday card also features colorful birthday candles that form the words Happy Birthday. They certainly add an element of celebration! 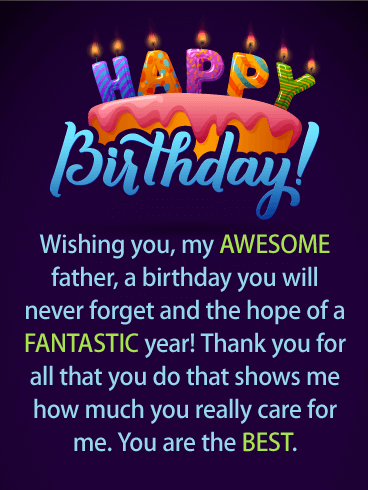 Send this birthday card on its way to let your father know how you feel today!